We present the finest value on market to our customers. 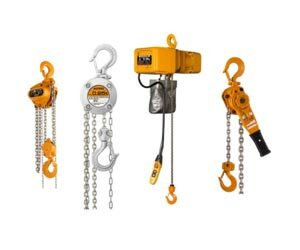 As a Supplier, Exporter and Importer, we proudly present Kito Chain Hoist. These chain hoists improve ease of use & work competence since an inverter has been provided as standard in a dual speed hoist and trolley. KITO chain hoists, therefore, provide long-period stable operation, which is essential for improving production efficiency. To maintain the quality that we’re renowned for, we procure from the vendors who are able to deliver perfect quality on a reliable basis.